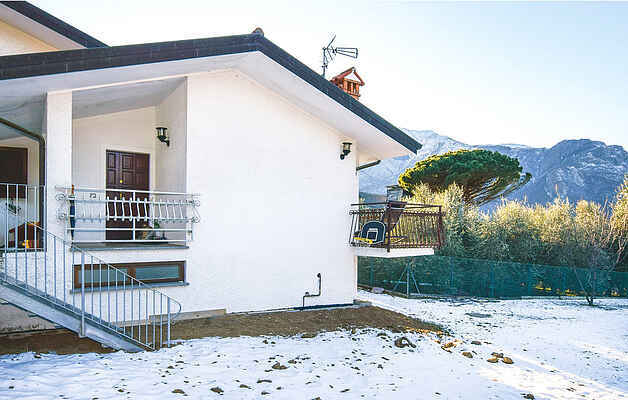 Holiday home in Colico approx. 600 m from the lake, in the district of Olgiasca, a splendid place on Lake Como, 12 km from Varenna, 35 km from Lecco and 65 km from Como away. The house is on three floors, bright and spacious ( about 235 m²) and equipped with a terrace with stunning views of the mountains around Lake Como, exclusive outdoor space equipped for outdoor dining. Deckchairs. Games for children. You can visit the Abbey of Piona, only 1.5km away, and in the summer months you have the opportunity to use the ferry connections to visit the most important places of the lake, such as: Varenna, Bellagio and Menaggio. The center of Colico is 4 km away and offers all kinds of shops, restaurants, equipped beach baths with lawns on the lake, the possibility of practicing water sports such as kite surfing, windsurfing, sailing and canoeing and hiking trails with varying degrees of difficulty in the hills and in the surrounding mountains. The Colico railway station offers connections to Milan (85 km) and the boat dock is open all year. Open parking place on the property.